Should we put Mum into a care home? Despite good care in the community and some additional private care at home, after a couple of years things with Mum were becoming unmanageable. The crunch came when on more than one occasion I found the gas hob turned on and not lit. Dad, whose sense of smell was not good, was just about to light it only stopped in the nick of time by me. Yes, we could have converted to all electric but there were other challenges, many of them, and it was clear Mum needed constant supervision and round the clock care. Had she been compliant, arranging this care at home might have worked but, like many people at this stage, she was mobile and still had a mind of her own, and a strong one. Dad, who was ninety-one, was at his wits end and I was stressed and exhausted with all the emergencies and travelling. I was on my own. What was I to do? I discussed my many concerns about Mum with the authorities and each time they visited her they asked her if she wanted to go into a care home. Not surprisingly each time she said, “No” and that was that. I couldn’t believe it. Fortunately there was a private care home next door to our house and, in desperation, I booked Mum in to it for a few days respite care and requested that they carry out a full assessment. Within 24 hours the matron called me and reported that there was no possibility of Mum returning home. She was deeply shocked at Mum’s state. Mum never came home. Overnight she had become a resident in a care home where she was to remain for the rest of her life. I was both relieved and devastated. What had I done? What I have just described raises some serious questions. I think the authorities perceived me as being a capable, which I am. But my mother was a danger to herself and others so why did they not listen to what I was telling them and respond appropriately? Their refusal to act could have cost lives. The authority had a responsibility to fund a proportion of the care in the care home, so was this really a funding issue? How many others find themselves in a position like this? Reflecting on this big move, it shouldn’t have been ‘an emergency’, I should have planned it. We were extremely fortunate that our house was next door to an excellent, privately owned care home. Over the years we had become good neighbours and when this ‘emergency’ arose they did everything they could to accommodate our needs at very short notice. It is unlikely you will find yourself in such a fortunate position so what should you do? There is a shortage of excellent care homes for people with dementia and the few that exist usually have long waiting lists. This takes me back to the point I raised in my previous blog about being aware of the big picture and planning ahead. I strongly recommend that long before the need arises, you do your research, identify a couple of care homes that you like, and put your loved one’s name on the waiting list. If a place comes up before it is needed that you can defer and of course, if you decide on a different path of care, you can cancel it. Ideally you and your loved one would make some visits the care home before he or she becomes a resident, in order to become familiar with the place and people. You might arrange a few days respite care in the home or go there for tea a few times. Looking forward to the next stage on our journey. Thank you! I am glad you appreciated what I wrote. Sometimes I feel like a lone voice. Thank you. I’m glad it was helpful. This post was written by me, Maggie La Tourelle. It was based on my personal experience. If you want to find out more you could read my book, The Gift of Alzheimer’s. could write а litte more on this topic? I’d bе very grateful if yοu could elaborate a little bit further. 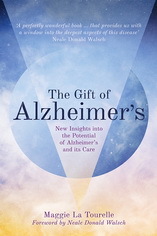 Read my book, The Gift of Alzheimer’s, for more information. lot more smartly-liked than you miught be now. made me in my vieww imagine it from a lot of numerous angles. gaga! Your personal stuffs excellent. Alwaays carde for it up! Thank you for your comment – I am please you are finding my blog posts interesting. Please share them with others. You will find more information in my book, The Gift of Alzheimer’s.